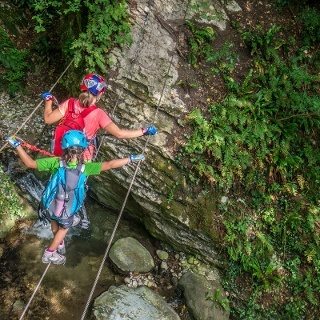 A new via ferrata close to the Rio Ruzza waterfall. Open in 2017, the equipped stretch is easy and short, also suitable for beginners and children. 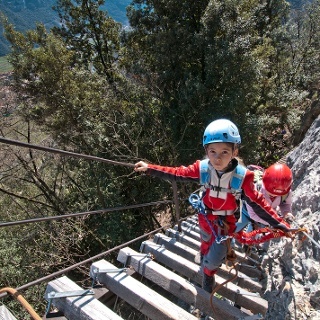 This via ferrata is suitable for children (from 140 cm), but remember that minors must always be accompanied. 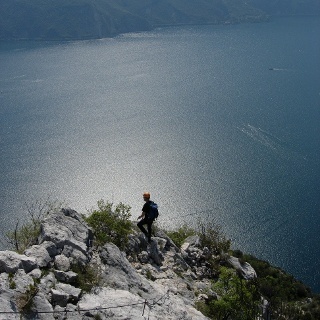 Only do the via ferrata if you are reasonably fit and in excellent health. Do not do the via ferrata in bad weather, especially if it looks like a storm is coming. 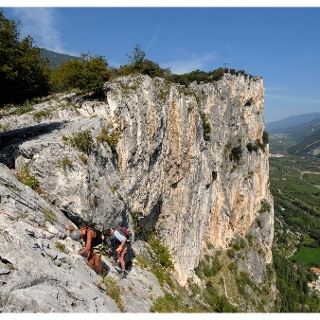 Do not do the via ferrata alone: if you have an accident nobody will be able to call for help. 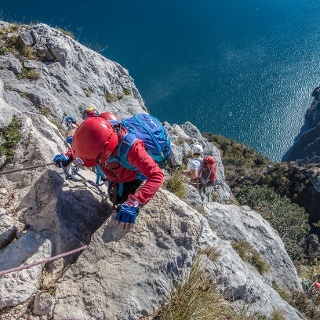 The risk of rock falls increases if there are others on the via ferrata or with wind or rain. Always check route conditions; in winter you may find snow and ice on some routes which make progression dangerous. Use proper safety gear (helmet, harness, ferrata kit with double self-locking carabiners and energy absorbing systems); put on your helmet once you get near to the wall. Rocks might fall before you get to the start of the via ferrata. During progression always keep both carabiners clipped onto the safety cable and when you pass the anchor points make sure at least one is clipped on to each safety cable. Only one person may be on any length of cable between two anchor points. Wear clothing suited to the altitude, the season and the length of the route: hiking boots and ferrata gloves to protect you from contact with the metal parts. Pay special attention on the easy parts where there are no cables. Always check the condition of the bolts and cables on the wall as they can suffer damage in bad weather. 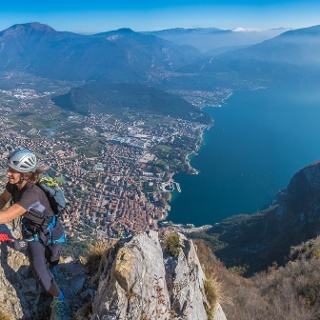 If you even think you see any problems that might compromise safety, turn back and let us know about the situation at info@gardatrentino.it. In an emergency call 118. These instructions are no substitute for the specific courses held by mountaineering associations or professional guides. Unless you have experience doing via ferratas, it is better to go accompanied by a mountain guide. The information on this chart is subject to inevitable variations, so this means that none of the indications are absolute. It is not entirely possible to avoid giving inexact or imprecise information, given how quickly environmental and weather conditions can change. For this reason we decline any responsibility for changes which the user may encounter. In any case, the hiker is advised to check the conditions of the places, environment and weather before setting out. A very short via ferrata but in a spectacular location running up along the course of a high waterfall. There are plans to extend it all the way up. A sequence of rungs take you up the vertical rock face (1) to the right of the waterfall, two short (2-3) Tibetan bridges take you across the waterfall bed and allow you to get to the suspended pool (4) at the foot of the mainspring. Go back to the starting point following the same ascent trail. 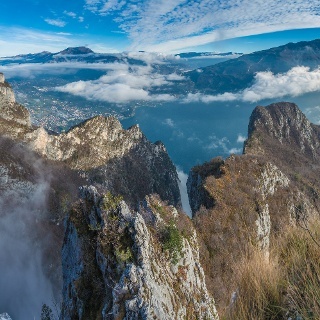 Ballino is about 15 km from Riva del Garda. It can be reached by taking the state road 421 towards Tenno / Terme di Comano. Several free parking spaces are available in Ballino. Bolted trail "degli Scaloni" - "delle Cavre" - "dell'Anglone"
This Via Ferrata is actually very short. It brings you in 5 minutes to a nice spot halfway the waterfall. It would be much nicer if it would go all the way up along the waterfall. Nice for kids, not really worth the ride for adults.